When pinning a Service Appointment it is not movable in the dispatcher console. The dispatcher will not be able to drag the service appointment around after it has been dispatched. This is how a pinned service appointment looks like on the dispatcher console. Note the little lock icon. Set the field 'FSL_Pinned__c' on the object 'Service Appointment' to TRUE. You could do this either with a workflow / process builder / trigger depending on your conditions. For example, when the status changes to 'Dispatched' you might want to pin the appointment. Right click the appointment and select 'Unpin'. Once unpinned you can move around the Service Appointment or change status as needed. How is the unschedule option controlled? Right click a Service Appointment and you would see an option 'Unschedule'. However, this option is not available when the Service Appointment is in certain statuses. This is controlled by the below setting. When a Service Appointment is in any of the status checked below, the unschedule option is not available. Status transitions control the permitted status flows. 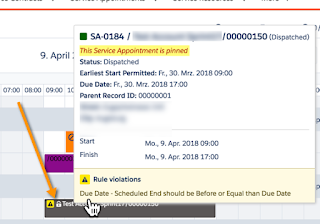 For example, if you want to unschedule a dispatched service appointment a status transition from 'Dispatched' to 'None' is required. Note that unschedule simply moves the status back to 'None' and removes the assigned resource on the appointment.